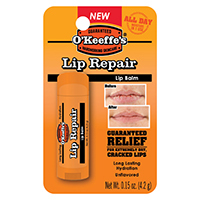 Keep lips soft and smooth with a moisturizing, protective lip balm. Effective for hours, prevents the need for reapplication. Make dry, chapped lips a problem of the past with a reliable lip balm. Petroleum jelly-based formula. Flavor: Original; Capacity (Volume): 0.35 oz; Packing Type: Tube; Quantity: 1 each. 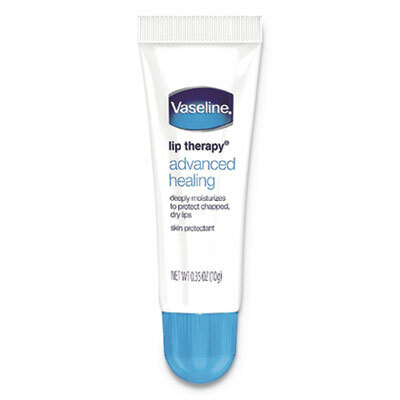 Vaseline� Lip Therapy� instantly softens and soothes helping to repair, not just coat, your lip barrier. Made with Vaseline� Jelly, it locks in moisture for beautiful, healthy lips. Gives lips a natural, glossy shine. Non-sticky, non-greasy formula spreads on smoothly. Unscented formula. Flavor: Original; Capacity (Volume): 0.6 oz; Packing Type: Mini Tin; Quantity: 1 each. Keep lips soft and smooth with a moisturizing, protective lip balm. Effective for hours, prevents the need for reapplication. 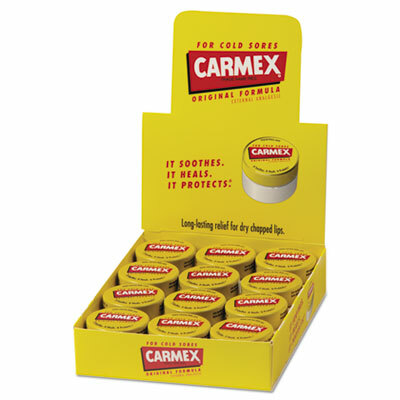 Make dry, chapped lips a problem of the past with a reliable lip balm. Petroleum jelly-based formula. Flavor: Original; Capacity (Volume): 0.35 oz; Packing Type: Tube; Quantity: 72 per carton. 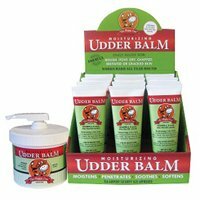 Moisturizing lip balm heals dry and chapped lips while protecting them from further damage.�Natural emollients are added to your lips, locking in your own body's natural moisture. 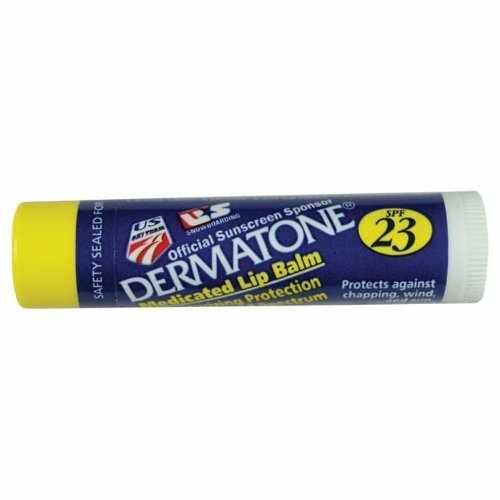 Alleviates cold sore symptoms.� Sun Protection Factor: SPF 15; Flavor: Original; Capacity (Weight): 0.25 oz; Packing Type: Jar. 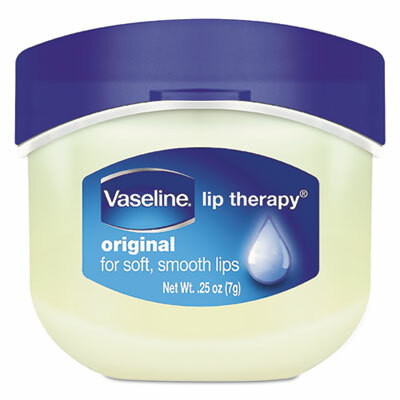 Vaseline� Lip Therapy� instantly softens and soothes helping to repair, not just coat, your lip barrier. Made with Vaseline� Jelly, it locks in moisture for beautiful, healthy lips. Gives lips a natural, glossy shine. Non-sticky, non-greasy formula spreads on smoothly. Unscented formula. Flavor: Original; Capacity (Weight): 0.25 oz; Packing Type: Plastic Flip-Top Container; Quantity: 32 per carton. 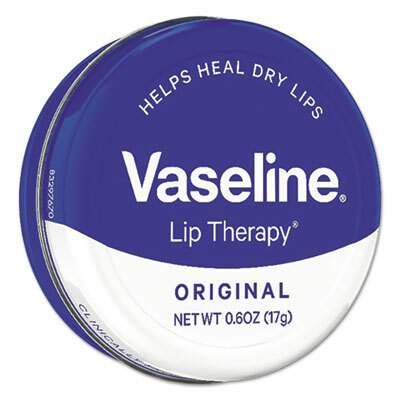 Vaseline� Lip Therapy� instantly softens and soothes helping to repair, not just coat, your lip barrier. Made with Vaseline� Jelly, it locks in moisture for beautiful, healthy lips. Gives lips a natural, glossy shine. Non-sticky, non-greasy formula spreads on smoothly. Unscented formula. Flavor: Original; Capacity (Weight): 0.25 oz; Packing Type: Plastic Flip-Top Container; Quantity: 1 each. 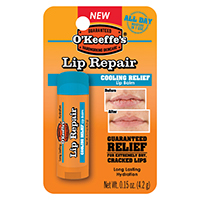 Vaseline� Lip Therapy� instantly softens and soothes helping to repair, not just coat, your lip barrier. Made with Vaseline� Jelly, it locks in moisture for beautiful, healthy lips. Gives lips a natural, glossy shine. Non-sticky, non-greasy formula spreads on smoothly. Unscented formula. Flavor: Original; Capacity (Volume): 0.6 oz; Packing Type: Mini Tin; Quantity: 12 per carton.